its people flowers and birds. The above statement although are words from Fiji’s official site cannot be ignored as propaganda as the visitors to this paradise vouch the same even if not in such flowery words. 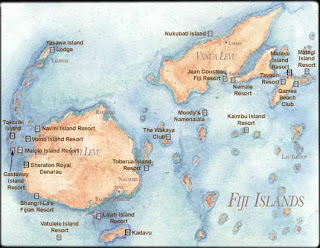 The nation of Fiji is an archipelago of 322 islands in the South Pacific; of these islands 106 are inhabited. Viti Levu and Vanua Levu are the major ones which contain 85% of the whole nation’s population. This article is an attempt to describe the exclusivities of this small island-nation; for those who are interested in exotic locations either for paying a visit or just for information. The capital of Fiji is Suva and this nation comprising of 322 islands has a total area of 18274 sq kms and a population is about 9 million. The entire population consists of different groups of people like ethnic Fijians of different islands and people migrated from India during the British rule (like all other third world nations Fiji also was occupied by the British from 1874 to 1970). The languages prevalent are English (a remnant of the British Raj), Bao Fijian (language of the early settlers) and Hindustani (a combination of Hindi and Urdu; arrived with the Indian migrants).. Ethnic strife has always been the here between people and it works against the democratic process. Fiji’s GDP is about 5.5 billion and the per capita income is US $ 6500; its economy is heavily dependent on fishing, small industries and tourism. Fiji got its independence in 10th October, 1970 ever since democracy has found it hard to get entrenched in this small cluster of islands its politics has seen many upheavals as due to ethnic strife one group never let the other rule whether democratically elected or not. Fiji had gone through two major coups; the first by George Speight who captured power from Mahendra Chaudhry the then Prime Minister, and the second by Sitivani Rebuka who came to power by a military coup in 1987.. At present this island is being ruled by President Ratu Josefa and Josaia Voreque the Prime Minister. The political issues have not much affected Fiji’s position as a major tourism destination; as its people have always been friendly lot and impress the tourists in that aspect. 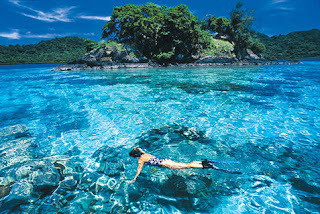 About 43000 tourists visit this archipelago every year adding wealth to the coffers of Fiji. In local English language ‘bure’ is the word for house; of late this word is commonly used for a thatched Fijian style-hut in tourist resorts; where as a traditional house in Fijian is known as ‘vale’ or vale ‘vaka vakaviti’. ‘Were’ (inland dwelling houses of western Fiji), Navananitawake (pre-Christian temple), Vale Kubulolo (found in Lau islands of Eastern Fiji) are all examples of the traditional Fijian style of construction. A common feature of the traditional Fijian houses is a timber frame and thatch, this particular structure gives warmth in cold climate and cool in hot seasons. Most of these ‘bures’ or ‘vales’ are built on earth mounds, edged with stone or balabala (tree-ferns, cyathea lunulata, but some are simply built on the ground while others (vatavata) are built on platforms over the sea. In ground plan they can be oblong, square, oval or circular, and the materials used for the walls and the thatch vary largely according to materials which are locally available. While ‘gasau’ (reeds, miscanthus floridulus) and vadra (Pandanus versus) are perhaps the most commonly used, ‘misimisi’ (sedge, scirpodendron), sugarcane, coconut, and sago palms are extensively used. Many traditional houses have sections of a tree-fern trunk protruding out of both ends of the top (this is only mainly for ornamental purpose and it has no function); which is known in Fijian as ibosa or loru. These have become iconic of Fijian architecture. The houses of Village-Chiefs are decorated with sea-shell (cowry). The thick terrestrial rain forest surrounding mountains ranging up to 1300 meters of this oceanic high islands in Fiji is home to a myriad of color and gaudiest form of more than 1800 native vascular plant species (orchids being most prominent among them) such spectacle is often taken for granted by the locals but never failed to fascinate enthusiasts. They sport astonishingly weird shapes to look like butterflies, bees, a fly and a swan. Botanists flock to this virgin land in search of new species of orchids to be listed in the records. 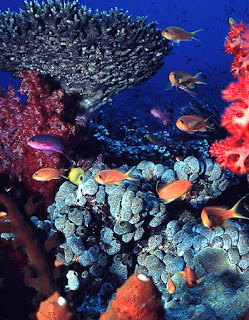 The geographical isolation of this archipelago is the main reason for the evolvement of so many exotic species. There are 65 orchid genera (major group) in Fiji of which 51 are endemic. Calanthe Ventilabrum reichenb found in Melanesia and Samoa with long and lasting inflorescence. Liparis layardii F. v. Muell (a very rare species found in Viti Levu Island) Dendrobium catillare Reichenb (only found in Fiji discovered in 1860, an epiphyte growing 50 cm long) Dendrobium mohlianum Reichenb (has the largest number of species (21) found in Solomon Island and Vanuatu and Somoa an epiphyte growing to 70 cm in length). Glomera montana Reichenb found in 1855 from Lomaiviti by William G. Milne a botanist. The British as well as other colonists have introduced totally 29 types of birds from their homeland as well as from their other colonies to this land and half of them got settled and flourished in this land. Red-vented Bulbul (Pycnonotus cafer, an aggressive and quarrelsome little bird native of the Indian Sub-Continent with erect crest, black head and red ventral tail), these birds were not imported for any purpose but they probably escaped from captivity to lead a free life and flourish in this beautiful land! Spotted Dove (Fasoro Streptopelia chinensis) – called as kukuru; black and white spotted half-collar, it is one of the most widespread exotic birds of the island), it is a native of South East Asia. It was in 1923 it was established that the bird has settled in Fiji, now barring Kadavu Island these birds are found almost all islands of the archipelago. Australian Magpie (introduced in to Fiji to control coconut stick insect, native of Australia; at present they have cross-bred with indigenous varieties and mostly hybrids), Java –Sparrow (Padda oryzivora - beautiful large finch with light-grey plumage with contrasting black head with white cheek patches. A globally threatened species), Jungle Mynah (Acridotheres fuscus, introduced in to the viti Levu in 1900 for controlling Army-Worm caterpillars –a serious pest to many crops) etc are just some of them. They are found abundantly in Viti Levu and Ovalau and their immediate offshore islands. A heaven for earth for tourists! Fiji is a place with ideal sub-tropical climate where temperature does not exceed 35 degree c even at the peek of the summer, yet air-conditioning is available in almost all resorts worth its name. The rainy season is from December to February, tourists can avail bicycles available for nominal rent for sight-seeing without any fear as crime-rate is one of the lowest in the world. Room rents are affordable one US$ can fetch two Fijian dollars. Fiji is the haven for surfing enthusiasts as the waves are ideal for the sport Frigate-Pass and Kadavu are crowded with surfers. 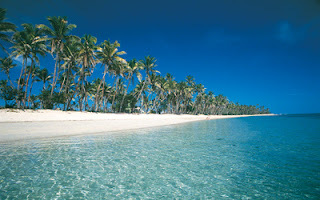 What else are required for a tourist to spend some time in merrymaking; as everything under the sun is here at Fiji? Hey, this is a very useful post about Fiji. Haven't been there yet but sounds like a great beach resort especially when compared to some of the other ones which are more popular such as Bali, Maldives.